The Marble betta was created by a prison inmate named Orville Gulley who used to raise his bettas in peanut-butter jars. The story goes that Orville was trying to create a black butterfly betta, and inadvertently discovered the marble gene. He sent some of these fish to IBC hobbyist Walt Maurus (as well as a handful of other breeders) who took a fancy to the fish and began breeding them for pattern. 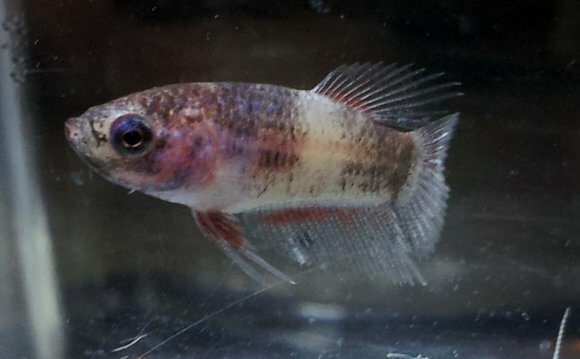 They are like the Pinto horses of the betta world, dark solid-colored blotches on a white or flesh-colored body, or vice versa. The first marbles were black/whites, but since then they have been developed into virtually every shade imaginable, and have helped to shape many of the new colors now possible in bettas. Marble is most likely a partial dominant*, so crossing a marble to a solid-colored fish will usually give you mostly solid-colored fish, with perhaps a handful of marble-patterned. If the solid-colored parent carries the gene for marble, your percentage of marbled fry is increased. The marble gene affects the solid color in unpredictable ways, making new color combinations and patterns possible. However, the breeder will probably have to go through several generations (and many culls) before attaining what he or she has in mind, and after that is faced with the challenge of getting the new color to breed true. Breeding marble to marble will usually get you some dark-bodied solids, some light-bodied solids, some butterfly, and some marble. The solid-bodied butterfly from a marble spawn will have the same inherent characteristics of a solid color that comes from a marble line; when the butterflies are bred to the same solid color that comes from a solid colored line, the fry will all carry a butterfly partial dominant gene. Spawns of either light bodied solid color or dark bodied solid color Bettas from marble stock will produce some marble, some solid color and some variegated fish. If the marble genes are introduced into a stock of true-breeding solid colored fish then it becomes extremely difficult for the breeder to return his stock to the pure-breeding solid colored type. The fish generally seem to always throw some marbles or parti-colored fish. A cross of a marble stock fish of one color type can produce the marble effect in the color of a fish of a non marble type. One of the most recent fundamental discoveries in the science of genetics is the existence of 'transposable elements' also known as 'jumping genes'. Apparently there are certain genes which are capable of moving from one location to another on an organism's chromosomes. Sometimes they will insert in places where they interfere with gene expression. This results in a cell's (and its daughter cells') inability to perform certain tasks associated with that gene. Because the 'jumping gene's' residence at a particular place in the chromosome is only temporary, the inability of the gene interfering to express itself is only temporary. If a jumping gene is present and it inserts itself into a gene responsible for producing a black (melano) pigment, it stops the production of black (melano), and all the progeny cells (a clone of cells) will be unable to produce black (melano). This results in a non-black patch appearing; looking like a white or cellophane patch. The reverse can happen too! If the cells are unable to produce black (melano) because the transposable genetic element is present, and the element leaves then the progeny of this cell (a clone of cells) will be able to produce black (melano) again (reverts) and a black (melano) patch will appear.